Looking for volatility exposure? Learn about volatility products including VIX options. If history has taught us anything, it’s that you can expect market uncertainty. But many active traders say that a little volatility can actually be a good thing, especially if you’re prepared. So the next time a storm of volatility and uncertainty comes rolling into the markets, make sure you know your volatility strategies. You might just be able to catch a wave or two. Volatility as an Asset Class? In general, there’s an inverse correlation between the Cboe® Volatility Index (VIX) and the stock market. When the market drops, fear and uncertainty tend to rise. Inversely correlated investments, such as “inverse ETFs,” can be used to potentially provide balance and diversification to a portfolio, especially during periods of uncertainty. But these products are subject to unique risks because of their use of derivative positions. They require active monitoring and management (as frequently as daily) and aren’t suitable for all investors. A number of tradable and investable volatility products exist, including options, futures, exchange-traded funds (ETFs) and exchange-traded notes (ETNs). So, is volatility an asset class? 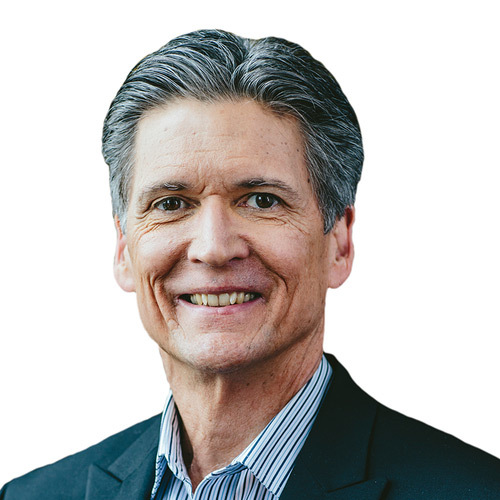 If you’re comfortable using volatility products to help you pursue your objectives, does it matter? One point worth noting, however: VIX is a mean-reverting product. It doesn’t move in one direction over long periods of time, like the stock market has over the last decade. Typically, once fear subsides, VIX does return to a mean. This can be an important consideration when managing volatility trades and positions. First things first: You can’t buy the VIX. Not directly, anyway. It’s a reference rate—an index made up of the implied volatilities of a basket of short-term options on the S&P 500 ($SPX), normalized to a 30-day constant maturity. But there are ways to sell and buy volatility exposure. VIX Futures. One way to get volatility exposure is to consider VIX futures (/VX), which are simply the market’s anticipation of where the VIX will be at monthly points in the future (see figure 1). VIX futures are cash settled, with a final settlement value equal to $1,000 times the settlement price. So, for example, if you buy a VIX futures contract for 15 and it drops to 14, you’ll be down $1,000. The minimum tick size is 0.05, which represents $50. VIX futures settle to a settlement reference index under the ticker symbol VRO. But futures aren’t for everyone. They involve leverage, and not all accounts allow the trading of futures. Plus, if you’re looking to buy and hold volatility, the value of your investment might erode over time. See the slope in figure 1? 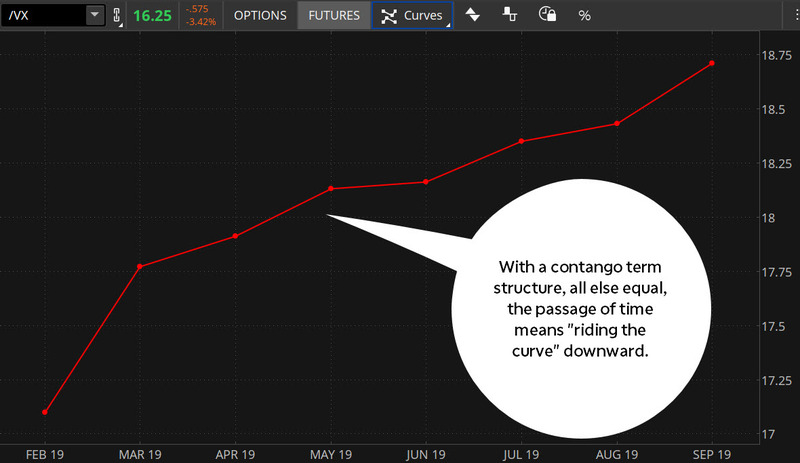 If you were to buy a futures contract a few months out and roll it to a deferred-month contract as it approaches expiration, assuming no changes to the term structure, you’d essentially be riding this curve downward. That’s called “contango loss,” and here’s a hypothetical example. Suppose you bought a May contract with about three months until final settlement around the price of 18.1, as shown in figure 1. Note that, at the time of your purchase, the March contract (with about one month to go) is trading around 17.8. If the term structure remained the same over the next couple of months, two months later your May contract would go from having three months until final settlement to having one month to go. It would be priced (theoretically) around 17.8, where the one-month contract is trading now in figure 1. FIGURE 1: RIDING THE VIX FUTURES CURVE. In typical markets, the term structure of VIX futures (/VX) slopes upward (called “contango”). Want to see today’s curve in the thinkorswim® platform from TD Ameritrade? Under the Charts tab, type in the symbol /VX and select Futures. Data source: Cboe Global Markets. For illustrative purposes only. Past performance does not guarantee future results. If you’re a seasoned option trader, you’re likely familiar with the basic options strategies (and perhaps some not-so-basic options strategies). If you’re considering adding VIX options to your arsenal, be assured that most if not all of these strategies apply. For example, are you anticipating a rise in market volatility? You might want to explore a bullish options strategy such as buying a call or perhaps a long vertical call spread. Or perhaps your objectives might be better served by a vertical credit spread—the sale of a near at-the-money option along with the purchase of a further out-of-the-money option of the same expiration date. Uncertainty is a fact of life and the markets. So the next time the winds of uncertainty blow in a wave of volatility, perhaps you’ll consider hopping on and going for a ride. Volatility ETPs are subject to significant risk and are intended for sophisticated investors who actively manage their investments daily. Volatility ETPs are intended for short-term trading, should not be used as buy and hold investments, and should not be expected to appreciate over extended time periods. Leveraged and inverse ETFs entail unique risks, including but not limited to: use of leverage; aggressive and complex investment techniques; and use of derivatives. Leveraged ETFs seek to deliver multiples of the performance of a benchmark. Inverse ETFs seek to deliver the opposite of the performance of a benchmark. Both seek results over periods as short as a single day. Results of both strategies can be affected substantially by compounding. Returns over longer periods will likely differ in amount and even direction from the target return for the same period. These products require active monitoring and management, as frequently as daily. They are not suitable for all investors.